The act of insertion of a microchip into a cat carries a risk. I’ve noticed two stories on the Internet that indicate to me that the insertion of a microchip into a cat, a routine procedure, can carry a risk of damage to the cat’s spinal cord. Micro-chipping cat injure a cat. The cat is a Devon Rex and he lives indoors all the time but his owner still believes that micro-chipping is a good idea. Do you? I am sure that this particular risk is small but nonetheless it appears to be real. There are two reasons why there is a risk. The first reason is the fact that inserting a microchip into a cat is a routine procedure. This results in the fact that technicians working at a veterinary clinic are sometimes, perhaps commonly, employed to carry out this simple and straightforward procedure. Are they always well trained and competent? Do routine procedures sometimes result in a lack of adequate care due to complacency? The second reason is the fact that the microchip is inserted below the skin at the back of the neck (nape of the neck) between the shoulder blades on the dorsal mid-line (the middle of the cat’s back). Interestingly, it may be the case that in continental Europe veterinarians implant the chip on the left side of the neck. This brings me to the observation that inserting the microchip on the left side of the neck is safer than inserting it on the mid-line between the shoulder blades. We know that below the skin, along the mid-line of the cat, there lies the spinal cord surrounded by vertebrae. 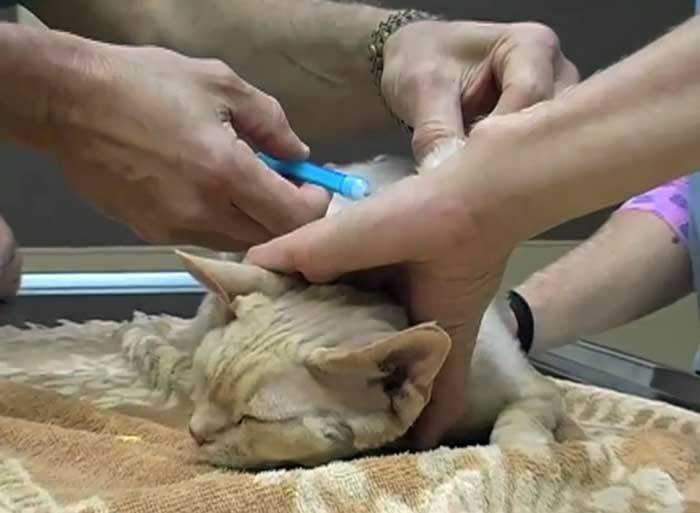 If the technician has received poor training, or is uncertain, he or she could place the hypodermic needle that carries the microchip against the cat’s spine below the skin. If this happens, the microchip could then be injected between vertebrae and against the spinal cord or into the spinal cord. In the picture above this article you will see that the American veterinarian has pulled up a lot of loose skin so that he is sure that when he makes the injection the needle is distanced from the spinal cord. I believe that the continental procedure (if this is indeed the procedure) is safer because it avoids the possibility of the needle going anywhere near the cat’s spine. I mentioned two cases which motivated me to write this article. In one case a cat in England went in for a routine micro-chipping that was without charge and the person who did the micro-chipping appears to have been inexperienced and we are told that she struggled to do it correctly and ultimately rammed the needle very hard into the cat and injected the chip between the first and second vertebra in the neck, which paralysed her. The cat’s owner was compensated with a £3000 payment which represented the cost of the surgery to repair the damage. The cat may make a full recovery but at the time of writing this she is still partially paralyzed, as I understand the story. Now turning to America, there is a story of a cat that was born in a rescue center who went in at 12 weeks old for a routine microchip procedure. At the moment that the microchip was inserted, the cat’s body went into a spasm. This appears to have injured her spine which left the kitten paralyzed. I do not know, in this instance, whether the needle touched the spine but that would seem to be the case. The story does not make this clear. However, I have never read about a case where an injection into the skin between the shoulder blades has caused the cat to go into spasm. Accordingly, it would seem likely that the needle accidentally contacted the spine. I’m not saying that micro-chipping is dangerous or hazardous to cats. There are many benefits. However, if I were taking my cat to a veterinarian for microchipping I would quietly and politely introduce the subject of the risk of damage to the spine referred to in this article. This would put the veterinarian or his assistant on notice resulting in a guarantee that care would be taken. There is a further risk from micro-chipping. There have been reports about tumors developing around or close to the site of the implanted microchip. After all, we are injecting a rice-sized piece of electronic kit into a cat. Despite the known benefits, the procedure is unnatural and therefore it is unsurprising that there may be a health risk. You can read about this particular aspect of micro-chipping on the following page: micro-chipping pets including cats. List of other articles on cat micro-chipping on this site. My thanks to Ruth aka Kattaddorra for finding this story. The British story. This entry was posted in Cat Breeds, Cat Health, Devon Rex, Human to cat relationship, Injury, Microchip, paralysis, Veterinarians and tagged cat health, human to cat relationship, injury, microchipping cats, veterinarians by Michael Broad. Bookmark the permalink. Before I read about the cat in England that was injected badly with a microchip I really was in favour of them because it’s proven that microchips do get cats back home, sometimes even after all hope is gone and I know Cats Protection have all cats chipped before rehoming them. But this is frightening, thinking back to having our two boys and Popsy chipped now it makes me come out in a cold sweat to think of taking even a miniscule risk of that happening to them. 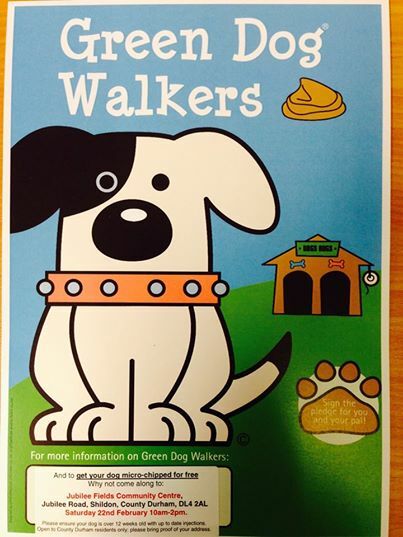 Though of course they were done by a veterinary surgeon and not an amateur. But I’ve just seen on our neighbourhood police page an advert for free microchipping, for dogs, and I’m thinking this is probably similar circumstances to where it happened to that poor cat. It is a bit frightening because it’s a very simple procedure and if people are advertising for free micro-chipping it would seem likely that it would be carried out by someone who is less skilled than a veterinarian. I think it would be all right as long as the cat’s caretaker supervises it in the knowledge that there is this health risk. Totally would only get it done at vet at this stage no need too. I think microchipping should only be done by an experienced person who knows a cat’s anatomy. The poor cat in England was done in a free session, proving that you get what you pay for! But the cat, not the caretaker, has paid the price. The good outweighs the bad in that microchipping done properly rarely causes problems, but it’s heartbreaking when things do go wrong. Lilly is chipped but not the other two. I don’t want to take the other two to the vet until I really have. Then maybe once we are there I’ll have done at the same time. I am a believer in reflective collars with tags on with a phone number and cats name facing forward so you don’t have to touch the cat to read it. If a cat goes missing it’s got more chance of getting back to you with a collar the a chip in my opinion. For the simple reason that a neighbour will see immediately where it’s from and not take it to a shelter for example. A friend just lost a 6 month old cat for 4 days – cat came back last night – but to be honest, the whole time we were coming up with theories of what happened knowing full well that if he had a chip that half those theories wouldn’t be possible since they involved people trying to help or just taking the cat because they like it. They live in a hamlet where alot of people are on weekend walks in the countryside etc. Any one of them could have seen the kitten miles from civilization and taken it home, to the vet, to the shelter, to a friend who wanted a cat…. Granted if the cat does reach a vet then a chip will show up when scanned. But I firmly believe there are many situations where the cat never reaches a vet’s scanner. Perhaps somebody feeds it and just keeps feeding it and enjoys the company. A collar makes it clear as the light of day that it’s not a wild or feral cat, and also gives you a place to put your contact info. What it should say in clear writing visible facing forward etc is the cat’s name, phone number clearly written (I used a printer) and the name of the town or area they belong (or street if it’s a big city). That way all those questions are answered before you even touch the cat. Also if the cat dies nobody is going to take it to a vet and get it scanned for a chip. If it died you would want to know. I myself have called a lady when I found her cat died on the road. Without the collar somebody would have eventually thrown him out or something and the lady would never know what happened. id love to get microchips sometime, love that idea of reflective cat collar.